GOYANG, South Korea (AP) — The leaders of North and South Korea played it safe Friday, repeating a previous vow to rid the Korean Peninsula of nuclear weapons but failing to provide any specific measures or forge a potential breakthrough on an issue that has captivated and terrified many since the rivals seemed on the verge of war last year. What happened Friday must be seen in the context of the last year — when the United States, its ally South Korea and the North threatened and raged as the North unleashed a torrent of weapons tests — but also in light of the long, destructive history of the rival Koreas, who fought one of the 20th century’s bloodiest conflicts and even today occupy a divided peninsula that’s still technically in a state of war. It marks a surreal, whiplash swing in relations for the countries, from nuclear threats and missile tests to intimations of peace and cooperation. 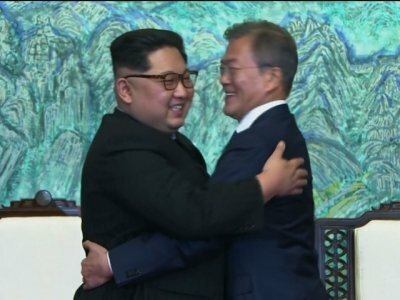 Perhaps the change is best illustrated by geography: Kim and Moon’s historic handshake and a later 30-minute conversation at a footbridge on the border occurred only meters (feet) from the spot where a North Korean soldier fled south in a hail of gunfire months earlier, and within walking distance of where North Korean soldiers axe-murdered two U.S. soldiers in 1976. Moon agreed to visit Pyongyang, North Korea’s capital, sometime in the autumn, and both leaders said they’d meet on a regular basis and exchange calls via a recently established hotline. They said they’d open a permanent communication office in the North Korean border town of Kaesong and resume temporary reunions of relatives separated by the 1950-53 Korean War. Both Koreas will also jointly push for talks with the United State and also potentially China to officially end the Korean War, which stopped in an armistice that never ended the war. AP writers Kim Tong-hyung, Hyung-jin Kim and Eric Talmadge contributed to this report.